Neil Rennison has been a significant presence in the Australian game development scene for some years now. He, and his development brand, Tin Man Games, quickly built a reputation for producing excellent classical game books for mobile devices. More recently, the ambition of the studio has branched further, with a miniatures board game adaptation of the classic game book, The Warlock of Firetop Mountain. As the team's most ambitious game to date, that succeeded on all fronts, and is a really good modernisation of the entire approach to game book design. 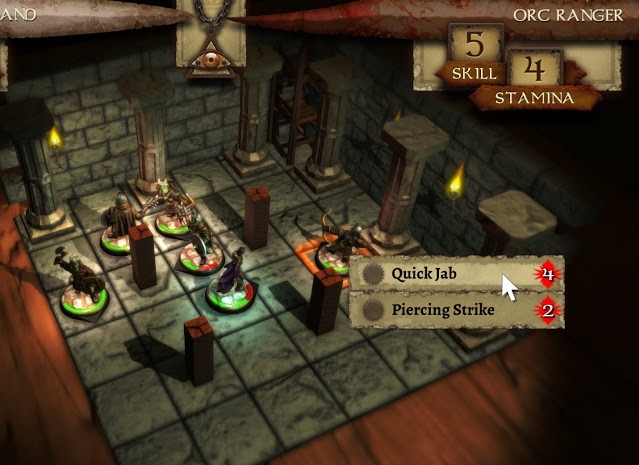 Related reading: Read Matt's review of The Warlock of Firetop Mountain here. More generally, Rennison has been a great presence and advocate for the local industry, and so we decided to have a quick fast five catch-up with him, see what he has been getting up to, and what's next on the agenda. Neil R: We’re working on a bunch of stuff at the moment, the biggest of which I can’t discuss at all sadly, apart from saying it will be our first ever console release! On our other fronts we’ve just released the second episode for Miss Fisher and the Deathly Maze for iOS and it also makes its debut on Android too. It’s an extension of the story arc that was begun in episode 1 as Phryne Fisher travels to 1920s Broome to solve another murder. It’s part visual novel and part choose-your-own-adventure murder-mystery. We’re also working through our third Choices That Matter interactive adventure story, And Their Heroes Were Lost and preparing our second DLC for The Warlock of Firetop Mountain, called Dwarven Resistance! Longer-term we’re looking to release a collected version of all our old Fighting Fantasy digital gamebooks called Fighting Fantasy Classics, which will see some new additions from the now 35 year old gamebooks series. Neil R: From a creativity perspective the industry is currently looking really strong. There are some truly talented people making incredible games at the moment and the support for one another, within the community has never been greater. As an industry we’re still struggling to be recognised in the broader Australian consciousness though (ahem federal government) and a lot of the success I can see is down to people really punching above their weight and seeing the business side as a global issue. Here in Victoria we are indebted to bodies such as Film Victoria and Creative Victoria, and it’s wonderful to see shows like PAX Australia rise up every year. Don’t get me wrong, there are still problems we all need to work harder at combatting, and Tin Man Games has been on the bad end of some of those problems, but really the overall benefits of what surrounds us and our potential far outweighs these. I can only see us getting stronger and we hope that the government recognises that too in time. Neil R: I was a bit late to the party, but I recently played Firewatch and loved it. From the get-go of that game I was floored by the storyline and how that storyline then integrated itself into what was is essentially an experience about walking around the wilderness on your own, with only a radio companion, and finding strange stuff. I found the whole production from the art direction, through narrative design and the underlying tech of the game to be astonishing, especially with the size of the team. Other than that my game choices tend to revolve around football (soccer) games and I’m playing a whole lot of Pro Evolution Soccer at the moment. I’m strangely addicted to the Become a Legend mode where you play one player in the team. I spent most of my time running around waiting for a pass from another player. Nothing happens for much of the time…but I love it! I think the reason I enjoy it so much has to do with the fact I’m crafting my own narrative by becoming a young man trying to hone his skills and find his way in a very competitive world. Err…much like game dev. Except I’m not so young anymore. Neil R: I love the diversity of games that are appearing these days. There is so much choice, and good choice too. It’s very rare that I play something that doesn’t have a least one feature that I really admire. If I could change anything it would be the perception of developers and the games they develop from the point of view of gamers. Consumers are too quick to turn on hard-working people when something appears even slightly amiss. Combine that with the fact that consumer’s perceptions of value for money are super low, you end up with a lot of people getting angry at a developer for something that cost them just $2. I think constructive criticism is very important and I like receiving it, but sometimes the scale and balance of the anger versus how much that is worth doesn’t add up. Nail R: I don’t know what that is? Is it some form of Japanese food? I’ll have to go Google it.